Goodreads appetizer: From duchesses to chamber maids, everybody’s reading it. Each Tuesday, The London List appears, filled with gossip and scandal, offering job postings and matches for the lovelorn—and most enticing of all, telling the tales and selling the wares a more modest publication wouldn’t touch. The creation of Evangeline Ramsey, The London List saved her and her ailing father from destitution. But the paper has given Evie more than financial relief. 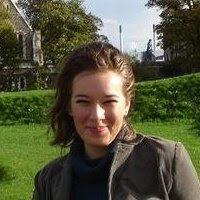 As its publisher, she lives as a man, dressed in masculine garb, free to pursue and report whatever she likes—especially the latest disgraces besmirching Lord Benton Gray. It’s only fair she hang his dirty laundry, given that it was his youthful ardor that put her off marriage for good. Lord Gray—Ben—isn’t about to stand by while all of London laughs at his peccadilloes week after week. But once he discovers that the publisher is none other than pretty Evie Ramsey with her curls lopped short, his worries turn to desires—and not a one of them fit to print. My Thoughts: I am a big fan of Maggie Robinson's Courtesan Court series (I think those were my introduction to historical erotica), so when I heard that there will be a new series after the Courtesan Court series comes to an end I was excited and impatient to see what it will be about. Well here it is, finally! Maggie Robinson's new steamy historical romance series is centered around the London List, a vastly popular and beloved Regency gossip rag. In Lord Gray's List, the first novel of the series, we learn how the magazine became the well known and celebrated paper it is and get a close look behind the scenes of how it is made. We discover pretty early on that the paper is published by Evangeline Ramsey, a young 30-ish woman who plays the part of a man, Mr. Ramsey out in society to be able to keep the press and their livelihood running. However, her ruse doesn't fool Lord Gray, all it takes is one look and Ben recognizes Mr. Ramsey as Evie, his first love, the woman he proposed marriage to when he was a young boy of only twenty. Though since Evie's rejection of his poposal he has lived a very promiscuous and sinful life, he never succeeded in purging his mind and heart of Evie's memory, so seeing her after more than ten years sure awakens some fond and some less agreeable memories for both of them. I found the two main characters wonderful. Evie was an incredibly unusual and visionary heroine: she was a feminist, an independent, most of the time grumpy and stubborn woman. I told him I’d hire someone to take over, but after several disastrous interviews, I decided to do it myself. I’ve never been a beauty, or especially graceful, and after the sneers I received from those I tried to hire—they treated me like a brainless feather-head, Amy. As if a woman couldn’t know how things should be done. It seemed the simplest solution—to become a man—far fewer impediments to moving about society. No chaperone necessary. No ridiculous rules of propriety. As a girl I’d sometimes larked about in boys’ clothing, but now I had reason to be serious. It’s the rare woman who is permitted to be successful in business, and I wasn’t interested in being unsuccessful—we needed every penny of revenue. Evangeline Ramsey was a romantic. A modern-day Don Quixote tilting at the windmills of British life, organizing everyone into the little cubbies he’d seen on the wall, turning Miss Sturgess into Cinderella with the stroke of a pen. For all Evie’s viciousness with him, she was a Fairy Godmother—or, in their minds, Fairy Godfather—to the rest of the world. Other women might have more up top, but she needed not an extra inch to compel completely. He’d best stop thinking of other women, not that anyone compared to his Evie. She was the love of his youth. She was the l— Dear God. What sort of spell had she cast over him? This was Evie. Difficult. Demanding. Ink-stained. And so very dear to him. one part of his brain wanted to call her disastrous, the other desirable. Perhaps Evie was both, but one thing Ben knew—she was giving him a headache right now to match the pain in his unattended erection. “Hm,” she said, damnably noncommittal. Perhaps if he rescued orphans from a burning building she might see him with new eyes, but setting fire to property was a criminal offense, not to mention causing worry to the poor children was not at all cricket. Verdict: Lord Gray's List was a delightful story and an engaging first novel in the new London List series. While I found the story dragged a bit in the middle and it could have picked up speed a bit faster, I enjoyed witnessing Evie and Ben's story and how they found love and happiness for the second time around. 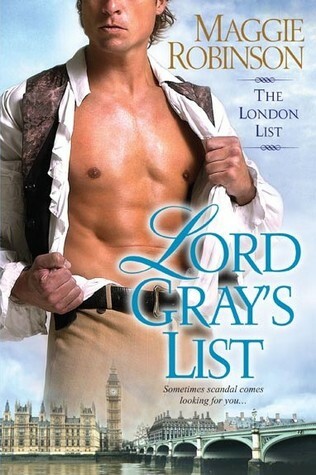 If you'd like to read an interesting and unusual, very steamy historical romance, pick up Lord Gray's List, I'm sure you'll be entertained! ;-) As for me, I can't wait to read the second book in the series, Captain Durant's Countess (which will be released in February 2013, yay! )!